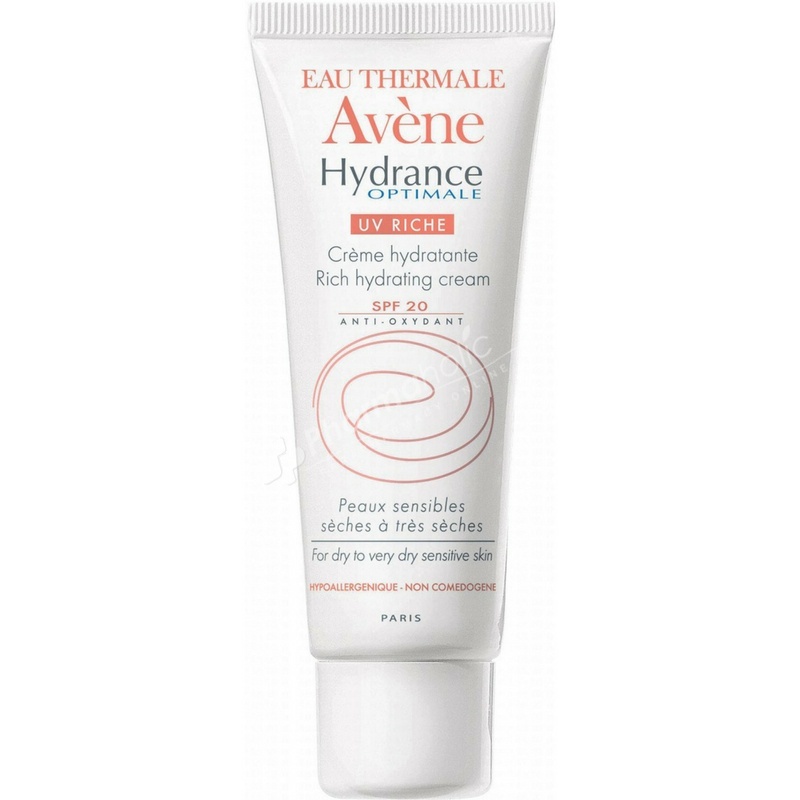 Avène Hydrance Optimale UV Rich SPF20 Hydrating Cream is a hydrating moisturiser to protect the skin from daily aggressions and help prevent skin ageing caused by the sun. For dry to very dry dehydrated sensitive skin. Get protective, intensive hydration for your dehydrated skin with the Avène Hydrance Optimale Rich Protective UV SPF20 cream. Hydrance Optimale Rich works to deeply hydrate parched skin, addressing the needs of dehydrated skin with targeted care. The delicate complexion is shielded from damaging environmental aggressors and added the SPF of 20 protects the skin from damage and accelerated ageing. Meiboserin limits the evaporation of the Avène Thermal Spring Water from the skin, while Lipomucine increases the coverage of hydration across the dermis. Avene Thermal Spring Water (Avene Aqua). C12-15 Alkyl Benzoate. Methylene Bis-Benzotriazolyl Tetramethylbutylphenol. Water (Aqua). Cetearyl Isononanoate.Diisopropyl Adipate. Isodecyl Neopentanoate. Bis-Ethylhexyloxyphenol Methoxyphenyl Triazine. Diethylhexyl Butamido Triazone. AluAvene Thermal Spring Water (Avene Aqua), Ethylhexyl Methoxycinnamate, Cetearyl Isononanoate, Cyclomethicone, Octocrylene, Bis-ethylhexyloxyphenol Methoxyphenyl Triazine, C12-15 Alkyl Benzoate, Glycerin, Polymethyl Methacrylate, Potassium Cetyl Phosphate, Carthamus Tinctorius (Safflower) Seed Oil (Carthamus Tinctorius Oil), Glyceryl Stearate, Stearyl Alcohol Benzoic Acid, Beta-Sitosterol Caprylic/Capric Triglyceride, Chlorphenesin, Disodium EDTA, Fragrance (Parfum), Glycine Soja (Soybean) Seed Extract (Glycine Soja Extract), Hydrogenated Coco-Glycerides, Hydroxyethyl Acrylate/Sodium Acryloyldimethyl Taurate Copolymer, Lecithin, Phenoxyethanol, Poloxamer 188, Polysorbate 60, Sodium Chondroitin Sulfate, Sodium Hydroxide, Squalene, Tocopheryl Glucoside, Water (Aqua), Xanthan Gum.